Always out in front of themes, Nanda Vigo has brought an unprecedented mentality of research into the world of architecture. A space entirely designed for one person, immersed in a setting of glass and light that changes over time. It would be hard to imagine a more engaging experience. This is the new work by Nanda Vigo, titled Global Chronotopic Experience. “The client wanted an immersive work,” she explains, “in which to be completely wrapped by a Chronotopos. 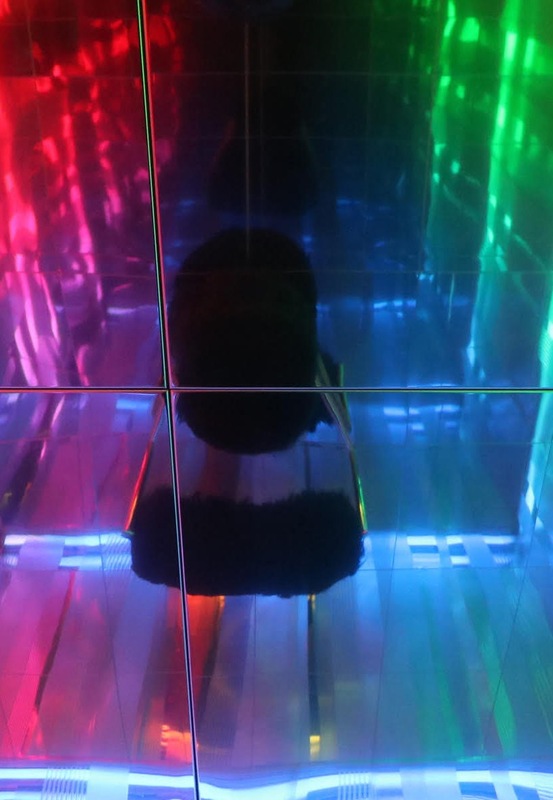 I have designed a cube with a base of 4×4 meters, with a 360° swivel chair at the center, where you can sit as if suspended in the void, with LEDs to create a rainbow effect. It is a space for one person only, and rather dismaying.” She smiles, satisfied with this description. But she knows that it is almost impossible to narrate that experience in words and photographs. Light, color and materials have always been the ingredients of the constructions of Nanda Vigo, an artist who crosses disciplinary boundaries. Precisely this way of going beyond conventional academic labels has helped her to often be ahead of her time, and today – as she continues a discourse that began over 50 years ago – the world finally seems to be ready to grasp her meaning. Time and space, Chronos and Topos are the realms in which her extraordinary story, as an artist and a woman, unwinds. 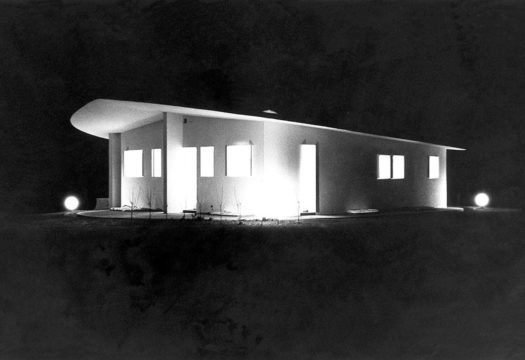 And it is inevitable to add a third factor, light, which revealed itself to her for the first time when she was a child, looking at the Casa del Fascio by Giuseppe Terragni in Como, where she understood the power of architectural design as a machine to construct space, light, atmosphere. This image convinced her to study architecture, but she immediately had the desire to open up to the world: she enrolled at the Lausanne Polytechnic, because she wanted to go to America after that (a degree from the Milan Polytechnic was still not valid in the States). Vigo wanted to design complex environments, in which to make the facings establish a dialogue with light, furnishings and works of art, where color would interact with the habits of the inhabitants. Back in Milan, she went to see Gio Ponti “because he was the only one who was not following a preset scheme, the only one who did not live his calling in separate compartments, but with freedom, shifting from one discipline to another, without preconceived notions. At the same time, she met and spent time with two men who were of fundamental importance in her life: Lucio Fontana, with whom she shared an artistic path that led to the co-design of the Ambienti spaziali in the 1960s, and Piero Manzoni, who became her partner. Two giants who did not always support her as an independent artist, and from whom Vigo had to psychological break free many years after their physical passing. 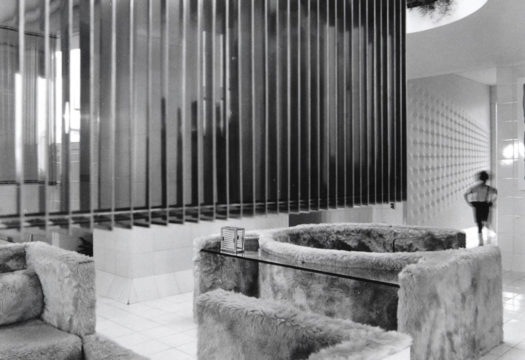 In 1965 a real test arrived: the interior design of the so-called Casa sotto la foglia by Gio Ponti. “I didn’t know,” she recalls, “whether to build in the style of Ponti or to go my own way. In the end I did it my way, and things worked out well.” The house conforms to Ponti’s sense of space, but it literally reinvents the interior through the surfaces of tiles and synthetic furs, in a constant dialogue between cool and warm, smooth and soft, reflecting and light-absorbing elements. Works by Fontana and Castellani were included, directly conceived for inhabitable architectural space. So we cannot help but return to Chronos: Vigo’s works have always been ahead of the radical avant-gardes of the 1960s and 1970s. It was not about setting records, but about recognizing the arrival of an unprecedented mentality of research, perhaps comparable only to the world of art. Looking through her projects – the Blue, Yellow and Black Houses or the more recent works for clients in Verona – we realize that they seem difficult only at first glance, but soon reveal their extreme adaptability to the life of those who dwell with them. These are interiors that listen to the deeper needs of inhabitants, triggering the idea not so much of living inside a work of art, as of making life into an artistic experience. This applies for those who want to be temporarily projected into a total experience, inside a Chronotopos (as in her latest work), or those who want to feel at home in a space she has designed. Global Chronotopic Experience, San Celso, Milan, 2018. Photo Marco Poma. The project comes from the desire of the collector Luca Preti to reprise the Ambiente Cronotopico which Nanda Vigo made in 1967 at Galleria Apollinaire in Milan. 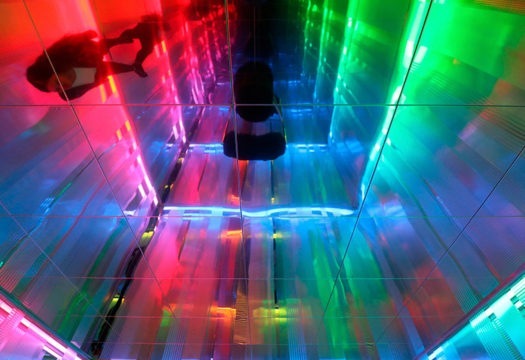 Here the environment becomes even more immersive, generating an experience through refractions and colors that wraps one visitor at a time, 360°. 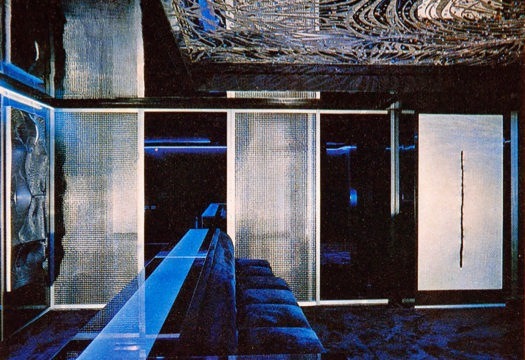 The dining zone of Casa Blu, 1967-1972, Milan. Photos Marco Caselli and Carla De Benedetti. 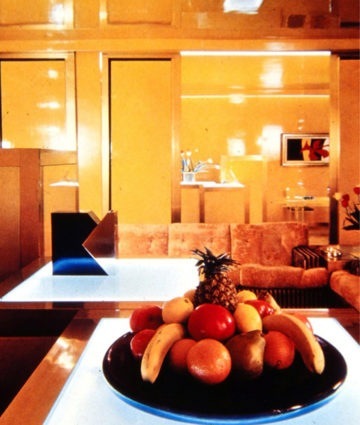 The living area of Casa Blu, 1967-1972, Milan. Photos Marco Caselli and Carla De Benedetti. Casa Gialla, 1970, Milan. A constant in the interiors of Nanda Vigo is the integration between inhabited space and works of art (often site-specific pieces), as well as the generation of new perceptions thanks to the choices of materials and colors. 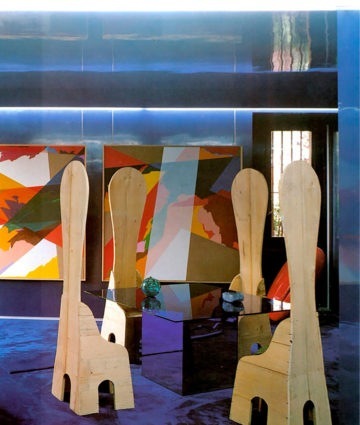 Nanda Vigo in collaboration with Gio Ponti, Casa Lo Scarabeo sotto la foglia, 1965-68, Malo (VI), living area with a work by Julio Le Parc. Photo Casal/Domus. The living area of Casa Lo Scarabeo sotto la foglia, 1965-68, Malo (VI), with a work by Julio Le Parc (foto Casal//Domus). The exteriors of this house were designed by Gio Ponti, the interiors by Nanda Vigo, who chose to independently interpret the living spaces, focusing on the relationships between warm/soft and cool/smooth materials. It represents one of the most successful cases of combination of interior, furniture and product design with architecture and art. 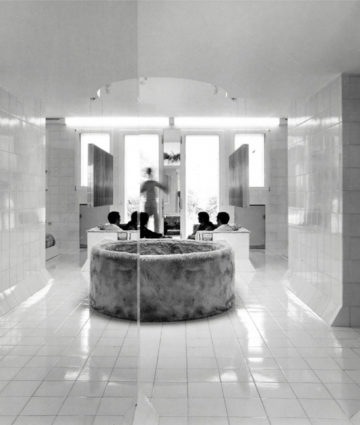 Nanda Vigo in collaboration with Gio Ponti, Casa Lo Scarabeo sotto la foglia, 1965-68, Malo (VI).